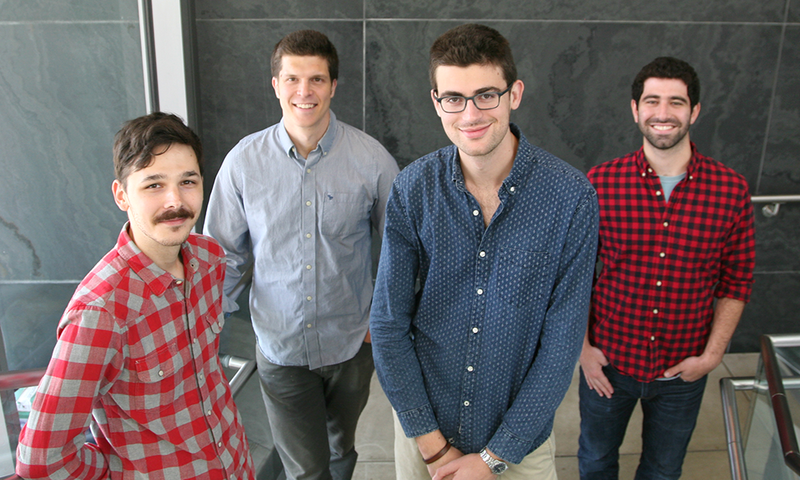 Four MCB grad students have been awarded prestigious fellowships that will support and sustain their research in the coming year. 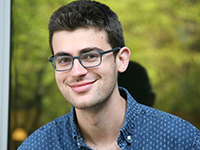 Vayu Maini Rekdal of the Emily Balskus lab received both an HHMI Gilliam Fellowship and an Ardis and Robert James Graduate Fellowship from GSAS. 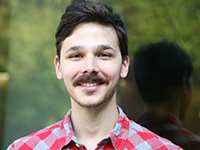 Julien Grimaud of the Venkatesh Murthy lab received a GSAS Merit Fellowship for outstanding students. Chistopher Bakerlee of the Michael Desai lab received a National Defense Science and Engineering Graduate (NDSEG) Fellowship, and G1 Jack Greisman received an NSF fellowship to support his lab rotation year. Evolution hinges not just on the mutations that an organism has but also how those mutations interact with each other. Some mutation combinations heighten the effects; others dampen each other. Some genes and traits, such as an organism’s method of reproduction, can even put their proverbial thumb on the scale and affect which mutations stick around in a population. “By watching yeast populations evolve in the lab, I will try to figure out whether these biological details have predictable effects on the types of interactions that crop up between these mutations and therefore predictably affect the outcomes of evolution,” Bakerlee explains. 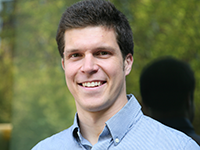 The NDSEG Fellowship will allow Bakerlee to continue his research in budding yeast. Getting the fellowship was a competitive process that involved writing an essay about his research goals, but the time spent applying for fellowships was well worth it. “This fellowship will give me resources and autonomy that will help me as I train to become an independent scientist,” Bakerlee says. Tracking changes and movement in proteins and other biomolecules is extremely difficult, as many reactions take place in a split second and are hard to isolate from the jumble of constant catalytic activity in living cells. However, Greisman hopes to develop new methods for tracking protein dynamics. Recipients of the NSF Graduate Research Fellowship Program (NSF GRFP) receive support for three years of graduate school study. As a G1, Greisman will be rotating through three labs before beginning his dissertation research. “I am looking forward to using this first year to explore a few different approaches to studying protein biochemistry,” he says. However, Greisman’s also extend into science communication. “Beyond my work in lab, this fellowship will help me to continue to engage in science outreach to a broader community,” he says. 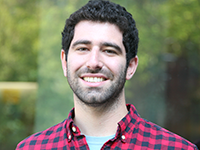 “It is important for scientists to communicate our work and to foster an interest in science outside of the university.” Greisman says that the NSF Fellowship will help him pursue that work. Before coming to Harvard, Grimaud earned an M.S. in Neuroscience in France and met his eventual advisor Venkatesh Murthy during a year-long sabbatical at Harvard. That experience inspired Grimaud to apply to Harvard for his Phd program and refocus on systems neuroscience. Murthy remains one of the biggest influences on Grimaud’s science. “Nothing could have been done without the help and support of Pr. Murthy, who gave me precious advice not only on the scientific content of the fellowship, but also on how to put everything together into a successful research proposal,” Grimaud says. Grimaud must have made a favorable impression, too. The Merit Fellowship is an internal Harvard GSAS fellowship offered to outstanding students. It also happens to be one of the handful of fellowships that are available to grad students from overseas. “When Fanuel Muindi [assistant director of GSAS] told us about this GSAS grant open to foreign nationals, I thought it would be a great opportunity – and maybe the only opportunity during my PhD – to challenge myself and improve my grant-writing skills,” Grimaud says. Vayu Maini Rekdal is both a chef and a scientist, a food enthusiast who seeks to understand how the trillions of microbes in the human gut affect human health. This year, he is the recipient of both the Gilliam Fellowship from Howard Hughes Medical Institute (HHMI) and an Ardis and Robert James Graduate Fellowship from Harvard GSAS. The Gilliam Fellowship supports up to three years of dissertation research, and the Ardis and Robert James Graduate Fellowship provides financial support to exceptional grad students. Rekdal says that winning the prestigious Gilliam Fellowship would not have been possible without the support of his mentors in the department, including Victoria D Souza, Catherine Dulac, and Rich Losick. “The current Gilliam fellow Alyson Ramirez (G4 in MCO) was also incredibly helpful, guiding me through the application process and sharing her thoughts and insights from her experience during the previous year,” Rekdal says. He would also like to thank his professor and PI Emily Balskus, who supported his nomination and offered invaluable on feedback on his research and applications. “I wouldn’t be where I am without her professional and emotional support,” he says.